To Israel – if you want peace, end the occupation. Once again the conflict in Israel/Palestine has reached the pages of our media and the screens of our TV. As usual this is because it is Jewish Israelis that are the victims of the violence. When Jews in Israel get killed or threatened it is world news. When Palestinians suffer the same fate, our media is strangely silent. Yet it is Palestinians who suffer most of the violence. On an almost daily basis some Palestinians are subjected to violent aggression by Israelis, often resulting in deaths. The aggression by Israelis, whether illegal settlers or the army, is so pervasive and so regular, that it has ceased to be regarded as “news”. Violence of one kind or another against Palestinians is the norm. It is only when there is a massive Israeli invasion of Gaza or as now, when Jewish Israelis are the victims that the rest of the world sits up and takes notice. It cannot be emphasise enough that for Jewish Israelis there is no conflict or violence for most of the time. When they do suffer from a violent outbreak they always blame the Palestinians. Very few Jewish Israelis ever stop to think about why Palestinians resort to violence. If they were to stop and reflect for even a moment they would quickly realise that the root cause of Palestinian resistance and violence is the occupation. To quote Noam Sheifaz again: “We have to remind ourselves over and over and over again: the occupation is the ultimate terrorist infrastructure. One must be especially blind to think that extreme inequality and more than half a century of oppression could bring about any other result.” Both quotes are from a recent article by Sheifaz, Israel still holds all the cards, for the online magazine 972. The power to end the violence remains with Israel. Only Israel can act to halt settlement building and begin the process of ending the occupation. Alas without outside pressure from the BDS movement this is the one thing that most Israelis are unwilling to do. Much easier to just blame and keep on killing Palestinians. One of the persistent attacks on Jeremy Corbyn is to portray him as anti-semitic and a friend of terrorists. He has met all kinds of apparently nasty people and has defended both Hamas and Hezbollah. These two organisations are still regarded by the establishment as terrorist organisations. However Jeremy Corbyn is quite right to speak up on their behalf. Their designation as terrorists is meaningless. It is also worth noting that they are very different organisations, working in different countries. They do have some things in common though. The leadership of both tends to be very socially conservative and strict in religious observance. Many of their followers will also fall into this category, but by no means all. For both Hamas and Hezbollah are also providers of social, welfare, health and education services. But above all both are primarily resistance movements. Which means, like all resistance movements in history, they will when necessary, resist with arms. And this is what the British, American and Israeli establishments most dislike about them. There are significant differences between the two organisations. Hamas operates solely in Palestine. Like most Palestinians its members are predominantly Sunni Moslems. It was formed to offer a more steadfast resistance to the Israeli occupation of Palestine. An occupation which is illegal under international law and contrary to almost all UN resolutions. Despite this Israel continues to steal Palestinian land. What remains of Palestine in the West Bank, East Jerusalem and Gaza is effectively an open air prison. Israel controls just about everything, including the right to travel, both within Palestine and without. Unlike Fatah, which sold away almost all of the Palestinians’ cards with the Oslo agreements, agreements that Israel has never honoured, Hamas refuses to willingly accept Israeli demands for yet more subservience. For this refusal to accept permanent second class rights in their homeland, Israel has repeatedly tried to obliterate Hamas as a movement, with regular invasions of Gaza and incursions into the West Bank. Israel clearly does not care that in waging war on Hamas their military murders thousands of innocent Palestinians, with their massive reservoir of jet fighter planes, tanks and warships. These Israeli wars are nothing less than the slaughter of innocents. Yet it is Hamas that gets called the terrorist. Welcome to the double speak of the western world! Hezbollah on the other hand is a purely Lebanese movement. Unlike Hamas, Hezbollah is primarily a Shia Moslem movement. It was formed to represent, protect and advocate for the rights of the Shia minority in Lebanon. The Lebanon is a multi religious country with three main communities. Historically the Maronite Christians have been at the apex of Lebanese society and have dominated the offices of the state and the economy. Second in importance came the Sunni Moslem community, with the Shia more or less at the bottom of the heap. They were among the poorest and least represented people in Lebanon. However over the past decades the Shia have grown in numbers and by many unofficial estimates, due to the lack of any official census, the Shia may well be the largest community in the country. Alas for them they still remain third in the pecking order for state and government positions. As well as representing and advocating for their own religious community, Hezbollah has always been at the forefront of resistance to Israeli aggression and occupation. It seems to be somehow forgotten but Israel has a nasty record of invasion and occupation of Lebanon. The south of the county has borne the brunt of these illegal invasions and occupations. And the south of Lebanon is where most of the Shia community resides. So it was not surprise that it was Shia groups, the largest and most important of which was Hezbollah, which led the resistance and fight back against Israel. Yet once again as with Palestine the aggressor, Israel gets off with barely a slap on the wrist from the west, while the victims, Hezbollah, get tarred as terrorists. Absent further Israeli invasions of Lebanon, Hezbollah is most unlikely to get involved in any action against Israel. Its prime concern is the welfare and rights of the Shia community in Lebanon. As such they deserve our support and understanding. As does Hamas. As the main standard bearers of resistance to Israeli aggression, which goes on unabated, and mostly unreported in the west, Hamas will remain in the sights of the Israeli military. We should not be surprised if they from time to time choose to respond in kind. In both Lebanon and Palestine the real aggressors and promoters of terror is israel and its unrelenting determination to absorb all of Palestine. Time for Justice for Palestine. This time of year when many people’s thoughts turn to the Holy Land and carols are sung, is an appropriate time to spend a little time reflecting on the situation of Palestinians in the Holy Land. The next time you hear the lovely carol, Oh Little Town of Bethlehem, it is worth remembering that if Mary and Joseph were to undertake that journey today, they would have to pass through 31 Israeli checkpoints and miraculously find a way over a 30 foot high wall. For there is little of joy or cheer for Palestinians at this, or any other time of the year, for that matter. Discrimination, humiliation and occupation are the norm for all Palestinians living in the Holy Land. The much talked about peace that Israelis go on about, never seems to apply to Palestinians. Hardly a day goes by without some Palestinians suffering violence, often leading to death, at the hands of the Israeli military or from illegal settlers. Yet nary a word of this appears in our media. Who cares about the death of yet another Palestinian? Though Palestine is a relatively fare away place, we should never forget the West’s complicity in the sufferings of Palestinians. In the case of the UK this goes beyond complicity to actively promoting and facilitating the destruction of traditional Palestinian society. From the infamous Balfour Declaration, through the one sided rule over Palestine during the interwar years, to its continuing support for Israel, the UK has a lot to answer for. It almost beggars belief that our country could regard it as ethical to promise to give away the land of another people. Which of course is exactly what the Balfour Declaration did. Palestine was never the UK’s for us to give away to anyone. We cannot undo the disastrous decisions taken by previous UK governments. We can however lend our support to the campaigns for Justice for Palestine. In particular we can support the BDS movement. This is the campaign for Boycotts, Divestment and Sanctions against Israel. The BDS campaign is based on a rights-based approach. The campaign urges various forms of boycott against Israel until it meets its obligations under international law. By not buying Israeli goods we can make a small but effective stand against the injustices inflicted on Palestinians. The BDS campaign is not anti Israel. It is against the unjust and illegal actions of the Israeli state. BDS is a campaign for Justice, and one which merits all our support. 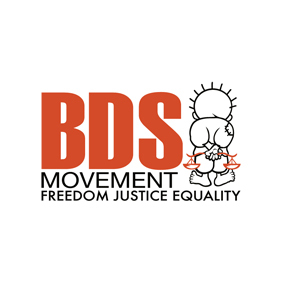 For more about the BDS movement visit their website here. It can be all too easy, wrapped up as many of us are in the warm glow of the Commonwealth Games and the referendum campaign, to ignore the terrible slaughter that is continuing in Gaza. For weeks now the Israelis have been pounding that tiny enclave with all kinds of bombs and missiles. That brave, moral army of Israel has by now succeeded in killing over 1,600 Palestinians, nearly all of them civilians, including women and children. Not quite sure what the legal definition of terrorism is, but this kind of wholesale slaughter must come pretty close to it. Yet our governments and most of our media still praise Israel for its restraint and its self-defence. All the very serious people continue the refrain – Israel has the right to defend itself. But hardly any bother to ask, self-defence against what? The standard Israeli response if ever asked, is self-defence against Hamas. And of course Hamas is always qualified as a terrorist organization. And Israelis then plead, who in their right mind would negotiate with a terrorist organization? Well just about every government in the world as it happens. Including the Israeli, when it suits them, which is very rare, to be true. But is Hamas a terrorist organization? A little bit of history here. Hamas is a Palestinian organization. It is not just limited to Gaza. Indeed Hamas won a majority at the last Palestinian parliamentary election across the whole of Palestine, including the West Bank. This was in 2006. Israel responded to this democratic election by refusing to recognize the new government and instead launched a series of raids in Gaza and the West Bank and arrested 33 of newly elected Hamas MPs. The USA and the EU supported Israel in this and imposed sanctions on Palestine. As a result Hamas was effectively restricted to Gaza. However Hamas remains popular across Palestine. Secondly, Hamas is primarily a religious organization and was founded in 1987 as an offshoot of the Muslim Brotherhood. As part of its religious work, Hamas provides most of the social, health, welfare, cultural and educational services in Gaza. This in large part explains its continuing popularity. Hamas workers are also regarded as generally honest and free of corruption. Thirdly, Hamas is a resistance organization. This of course is the bit that Israel does not like one little bit. The USA, the UK and the EU also do not like all this resistance. While Israel has the absolute right to self-defence, this right it seems does not apply to Palestinians. Palestinians obviously have no rights, only duties. And that duty above all is to know their place and to do everything to please and appease Israel. However, no matter what the Palestinians do in terms of recognising Israel, maintaining the peace, Israel never finds this enough. In the West Bank for example, Fatah has done just about everything that Israel has asked of it, yet this has not stopped the Occupation and its continuing encroachment into the West Bank. Appeasing Israel brings no rewards, only further humiliation and loss of territory. Resistance, it would seem, is the only option remaining to Palestinians. Resistance of course does not have to be violent. Gandhi in India led a non violent resistance to British rule. But let us be clear, resistance to Occupation is natural and enshrined in International Law. People living under occupation are entitled to resist, using any and all means at their disposal. This includes military resistance, using home made rockets and anything else at hand. People who resist occupation are always regarded as terrorists by the occupiers. The British have centuries of experience of this. Most of the now independent countries currently participating in the friendly Commonwealth Games in Glasgow, were once upon a time led by resistance fighters whom the British were quite happy to condemn as terrorists. Even when it was not directly involved, Britain was more than willing to regard just about all resistance fighters as terrorists. Remember Nelson Mandela anyone – that well known terrorist who was part of the military wing of the ANC and who never renounced the right of Black South Africans to use violence as part of their struggle for freedom. In many countries in Europe, the popular memory of the 2nd World War is heavily dominated by recollection of the various resistance or partisan movements that engaged in some very bloody actions against their German occupiers. At the time the Germans regarded these actions as terrorism and enacted even bloodier reprisals, often against the civilian population. Now these resistance fighters are national heroes. Palestine now is no different. Palestinians are living under a brutal occupation which continues to confiscate their land and which controls almost all aspects of their lives. Palestinians have the right to resistance this occupation. They have the right to use whatever means they deem appropriate and at hand. Hamas is not a terrorist organization, it is a legitimate resistance movement and we should support all those who bravely resist the Israeli occupation, including Hamas. Just take a look at the numbers of civilians who have been killed and maimed during this recent onslaught and work out who is indulging in a bit of terrorism. It is important to remember that not all Israelis or all Jewish people support the current Israeli onslaught. Here is a very good example of reporting and analysis from Noam Sheizaf, an Israeli journalist, who points out to his fellow Israelis just what this fighting is all about – Freedom for Palestine. Finally here is a beautiful poem, based on the Jewish Lamentations, written by Rabbi Brant Rosen. Remember, if you want peace, work for justice. The recent murderous events in Ukraine and Palestine offer yet again another example of the West’s addiction to hypocrisy. This time it is so blatant as the two events overlap. The shooting down of the Malaysian airplane over Ukrainian territory with the attendant deaths of all those aboard, has unleashed a veritable frenzy of outrage. Outrage primarily directed against Russia and in particular its President, Vladimir Putin. Some newspapers even went so far as to call Mr Putin a terrorist. All within hours of the shooting. Long before any concrete evidence could possibly have emerged. Now it seems that even the USA intelligence service doesn’t hold Russia or Putin responsible for the shooting. As yet nobody knows fully for sure who did fire the rocket or missile. Probably some pro Russian group of Ukrainians. But we still await concrete evidence. Not that the lack of evidence has ever bothered our media or most of the governments in the West. Any excuse for a bit of Russian baiting is game. Both the USA and the EU have called for further sanctions against Russia. While most of the media remain thralled to painting Russia as an insatiable, militaristic, expansionist enemy. The age old fear of Russia is never far below the surface in the UK. Contrast this fury and hatred of Russia and its leader Vladimir Putin with the equanimity with which the West continues to treat Israel and its leader, Binyamin Netanyahu. In the case of Israel and it latest, ongoing bloody massacres of Palestinians in Gaza, there is no doubt whatsoever who is to blame. Mr Netanyahu makes no attempt to hide his ownership of the current air and ground assault on Gaza. On the contrary he likes to boast about it. As with previous Israeli assaults on Gaza, this one is as one-sided as the others. Only Israel possesses the military hardware, planes, tanks, missiles and goodness knows what else. All of it the most up-to-date of its kind in the world. Israel also seems to possess unlimited amounts of these lethal weapons. On the other side the poor Palestinians have nothing much more than home made and pretty ineffectual rockets. This of course explains why so many Palestinians have been killed and severely wounded. Over 650 people have already been killed by the Israeli forces. The majority of these will be civilians, including too many children. While this time around Israel has also suffered some casualties, 31 at the latest count, all but two were soldiers. So the imbalance in the death toll, not to mention the destruction of buildings, is immense. The usual Israeli excuse that this is an exercise in self-defence is just more propaganda. There were no Israeli deaths in the years prior to the latest Israeli assault. The excessive response with the overwhelming majority of Palestinian deaths civilians makes a mockery of this claim of self-defence. You don’t need to kill hundreds of civilians to protect your country against home made rockets. Even the Americans admit that Israel’s assault is anything but pinpoint. Yet, despite all this knowledge about who is doing the killing and who ordered this killing spree, the West seems unwilling to do anything about it. Well the general public in most countries is pretty aware of what is going on and has made their disapproval of Israel known through mass demonstrations. However our leaders, especially in the UK and the USA are as wedded to Israel as ever. Israel in their eyes can never do any wrong. Russia, which was not directly responsible for one terrible action is subject to pillory, sanctions and an arms embargo, However, Israel, which is directly responsible for the ongoing killing and maiming of hundreds and hundreds of civilians is praised. No sanctions, no arms embargo, not even a mild diplomatic rebuke. Little in the past can equal this brutal and pathetic, if not unexpected, confirmation of the moral bankruptcy and hypocrisy at the core of the West. Israel is an uncontrolled war machine, masquerading as a state, a rogue state if ever there was one. Allowed to unleash its terror on Palestinians solely due to the complicity of the USA and its craven allies in Europe. Now is the time to take a stand for Palestine and the rights of Palestinians for justice. While most of us in Scotland are engrossed in the small matter of our own independence referendum, we must never loose sight of the struggles of others for justice. Today is one of these days. 15th May is the day when Palestinians worldwide remember with sadness the great Catastrophe (al Nakba) that befell their people in 1948. This was the year of the founding of the state of Israel as a state for Jews. To create a state for Jews the nascent Israel had to indulge in a bit of ethnic cleansing. This they did with gusto and ruthless violence. 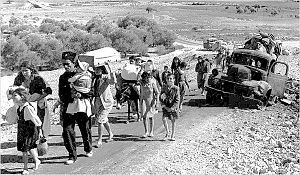 The residents of whole villages were massacred and around 750,000 Palestinians were expelled from their homes. They have never been allowed to return, against every tenet of international law and UN resolutions. The newly established Israeli state was not content to forcibly and violently expel Palestinians, they then destroyed their villages. Over 500 Palestinian villages were flattened and erased. Israel and its Zionist friends in the west have tried for decades to hide this massive ethnic cleansing from not just Israelis, but from the rest of the world. In this at least they are failing. The brutal and violent reality behind the creation of Israel has become more and more difficult to deny. Palestinians throughout the world use Nakba Day to remind themselves and the rest of us of what really happened in 1948. Even in Israel itself Nakba Day is forcing more and Israelis to confront their culpability for the crisis facing Palestinians. Jonathon Cook has a very good article on this which you can read here. The tragedy of the Catastrophe of that year is still alas all too alive in Palestine today. Ever since then Israel has used every opportunity to fight wars of aggression against its neighbours, all with aim of securing yet more land for Jewish only settlements. With the whole of Palestine, including East Jerusalem, under Israeli occupation, there is nothing to stop the israeli authorities from continuing to expropriate Palestinian land, to demolish Palestinian housed and to expel Palestinians. The Nakba is a continuing tragic reality for most Palestinians, who can only watch with horror and amazement at how the west remains silent in the face of constant Israeli aggression. Though it is the Americans who are the current bankrollers of Israel, we must never forget the inglorious role played by the UK in the foundation of Israel. The UK has to bear most of the blame for the current tragedy in Palestine. From the infamous Balfour declaration of 1917, in which the UK promised to give away somebody else’s land to Jews. It is almost incredible that less than a century ago, one of the UK’s most distinguished leaders could blithely and arrogantly sign away the birthright of hundreds of thousands of Palestinians. People who had never done any harm to Britain. Yet in 1917 our great leaders could with a stroke of a pen effectively sign their death warrant. It is most appropriate on Nakba Day for us in Scotland to be reminded not only of the tragedy of Palestinians, but also of the iniquity of the UK. Truly there is nothing “great” in Britain. While we cannot absolve ourselves of what was done in our name a hundred years ago, we can make sure that the aggression and arrogance that lies behind the UK and the Balfour declaration will no longer be a part of the future of Scotland. For an independent and peaceful Palestine and Scotland! The latest round of peace talks or to be more accurate, talks about peace talks between Israel and Palestine is just one more distraction from the fundamental issue – Justice, or rather the lack of justice in Palestine. The Israelis and their American friends are only too willing to talk about peace. In fact they like nothing better than to talk about peace. For that is all the Israelis have to offer – talks and yet more talks. All about the need for peace. Not a word about justice. At least not a word about justice for Palestinians. The whole thing is a sham and just a cover for yet further Israeli illegal land grabs. The so-called “Peace Process” has become a major enemy of Human Rights. This is not just my view, but the view of Michael Sfard, Israeli human rights attorney and legal counsel and co-founder of Yesh Din – Volunteers for Human Rights. He states in an interview with Israeli online magazine +972 that, “While talks are happening Israel gets away with anything. Land grabs, the expansion of settlements, even [Operation] Cast Lead was waged while there were peace talks.” When the world focuses its attention on the peace process, he explains, it is much less attentive to Palestinian victims and the cries of human rights organizations and civil society. In the past decade or two, “the peace process has become one of the major enemies of human rights,” Sfard continues, and “no peace process will be fruitful if people are suffering on the ground.” You can read the whole interview here. It is clear that from the Oslo agreements onwards to the present day, peace talks are immensely beneficial to Israel. The Palestinians get nothing out of them. In fact they continue to lose territory to the ongoing illegal settlements in the West Bank and in East Jerusalem. I guess the Palestinian leadership continues to participate in this charade, as the Palestinians are too weak to do anything else. However it is not clear just what endgame the Israelis and their American sponsors have in mind. The kind of peace deal that the Israelis are prepared to offer – retention of East Jerusalem, retention of all the illegal settlements – is something that no Palestinian leadership could ever accept. Not even one as weak and craven as the current one. Israel must know this, so it appears that the Israelis are looking for no more than a few positive words in the world’s press while they continue with business as usual. Which for Palestinians means the occupation continuing as usual. The Israeli and Zionist establishment is essentially bankrupt. They have no achievable long term vision for the area. What they really want of course is for the Palestinians to just go away. Which is why the Israelis make life as difficult and intolerable for Palestinians as possible. However the Palestinians are not going to go away. Moreover, however much the Americans support Israel, even the USA would balk at any military attempt by Israel to repeat what they did in 1948/49 – the ethnic cleansing of the remaining Palestinians in the West Bank and Gaza. So all that Israel can hope for is that things remain much as they are and that the rest of the world turns a blind eye. If the Palestinians continue to participate in meaningless “peace” talks, so much the better. 3. Equal rights for Palestinian citizens of Israel. These three demands are beautifully simple and very difficult for anyone to reasonably argue against. All are relevant and essential to any long lasting outcome. To take one example, the third demand – Equal rights for Palestinian citizens of Israel. In many ways this demand goes to the heart of the conflict. For Israel demands that the Palestinians and the rest of the world for that matter, recognizes Israel as a “Jewish” state. But as a Jewish state, Israel necessarily discriminates against its own citizens who are not Jewish. Including those, like the Palestinians, who were born in Israel and whose parents and grandparents were born there. Yet in all kinds of ways, the state discriminates against Palestinian Israelis, both formally and informally. Palestinian political parties are not in practice, allowed to form part of the government. The allocation of public money is heavily skewed in favour of Jews and Jewish communities. Despite the fact that around 20% of the population of Israel is Palestinian. So how could any Palestinian agree to recognizing Israel as a Jewish state? It is hard to imagine how any country could agree to recognizing Israel as a Jewish state as this implies discrimination against non Jews. Yet all Israeli governments continue to make this demand a pre-condition for any final outcome. The very fact that Israel refuses to treat all its citizens equally, should give our governments pause for concern. What are we in the West doing by supporting such an unjust state? There would be greater chance of a long term peace settlement if our governments were to join with the BDS movement in challenging Israel to give reality to these three simple demands for justice. 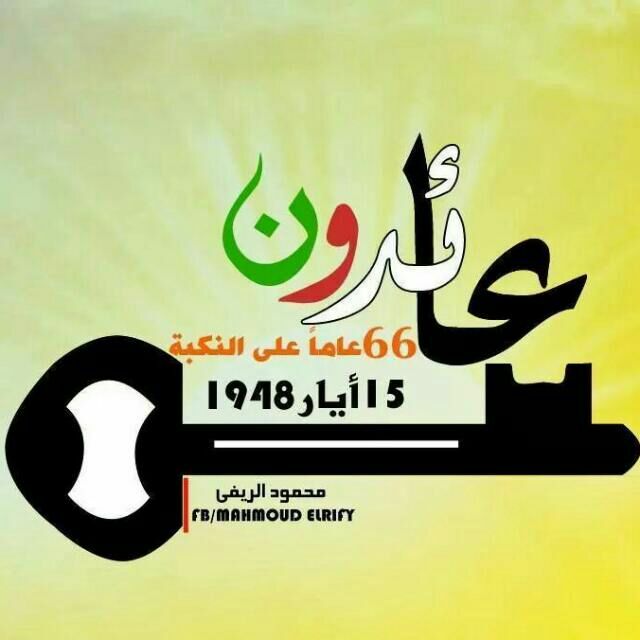 This week is the time when Palestinians commemorate the events of 1948 which resulted in the expulsion of the majority of the Palestinians then living in Palestine. This massive and deliberate ethnic cleansing carried out by the Jewish armed forces of the newly declared state of Israel remains the single most important event in the recent history of Palestine. Hundreds of thousands of Palestinians were uprooted from their ancestral homes and forced to live as refugees in camps throughout the Middle East. They have ever since been refused the right of return. It is this refusal on the part of the Israelis which turned them into refugees. As a result of this ethnic cleansing Palestinians lost 78% of their country to the new Zionist state of Israel. This is the “Catastrophe” that Palestinians refer to as Al Nakba. Though this Catastrophe took place in 1948 and 1949, the seeds were sown many decades earlier. And sad to say, the British government played an important and dishonourable role in the development of this tragedy. After the First World War the victorious powers were keen to promote self-determination amount the peoples of the defeated Empires in Europe, they were adamantly opposed to extending such democratic values to the peoples of the equally defeated Ottoman Empire. Instead the British and French, under the fig leaf of Mandates from the newly formed League of Nations, were allowed to effective run the remnants of the Ottoman Empire as their own colonies. Palestine fell to British rule and the Mandate included the well known clause in favour of “the establishment in Palestine of a national home for the Jewish people.” What is less well known is that this same clause included the further qualification, “it being clearly understood that nothing should be done which might prejudice the civil and religious rights of existing non-Jewish communities in Palestine.” The British of course failed miserably in exercising their Mandate responsibilities, though they did their best to favour the Jewish settlers in Palestine. Unwilling to grant democracy to the people of Palestine and unable to militarily control the area, the British did what they are famous for, they walked away and left the problems to the newly formed United Nations. This august body, which was hardly representative of the peoples of the world, decided in its wisdom to partition Palestine and to the surprise and consternation of many, awarded 55% of the land to the Jewish state and only 45% to a Palestinian state. This at the time when Jews only made up less than ⅓ of the population and Jews only owned 7% of the land. Then again it was maybe not so surprising. The UN at the time of the partition only had 56 members. It was also very much a white man’s club. Only four African countries were members and these included Liberia, almost a US dependency and white ruled South Africa. Asia had just 11 members. The majority of the member states came from Latin America, the Caribbean and the victorious European states from the Second World War. Plus of course the USA, Canada, Australia and New Zealand. It is fascinating to reflect that the part of the world in which Palestine lay – Asia, was the least represented in the then UN. It was also the region that most strongly opposed the partition, with nine of the 11 countries voting against. The votes in favour came almost wholly from Latin America, Europe and the Old White former British Empire. This vote probably reflected a mixture of anti-Arab racism and guilt at the sufferings of Jews in Europe, before and during the Second World War. What is beyond doubt is that the current more representative UN would never have passed such a partition plan. The Catastrophe of 1948/49 was not alas the end of suffering for Palestinians. Contrary to the image presented in the media of a peace loving nation, Israel seems to be in a constant state of aggressive war. And not just with Palestinians as Egyptians, Lebanese and Syrians can attest. It is though the Palestinians who continue to bear the brunt of Israeli aggression. Not content with the 78% of Palestine which they conquered in 1948/49, Israel in 1967 effective conquered all of Palestine. Though it claims not to an occupation the facts on the ground belie this. East Jerusalem, the Golan and other areas have been illegally incorporated into Israel. While the rest of the West Bank and Gaza remain under tight Israeli military control. Every year more and more Palestinian land is confiscated by the Israelis for Jewish only settlements – illegally it goes without saying. Every year more and more Palestinian homes are destroyed. Palestinians would like nothing better than to commemorate Al Nakba as history. But while Israeli aggression continues and continues with the active support or connivance of the US and alas the UK among others, Al Nakba remains an occasion to raise awareness and campaign for Justice for Palestine. Join in any of the many events being held this week in support of Palestine and in particular the demand from refugees for their Right to Return. There is unlikely to be a long term peace in Israel/Palestine until Israel recognizes its particular culpability in the Catastrophe. Thankfully more and more Israelis are beginning to come to terms with what this means. Though still a small minority, their voices are beginning to be heard. For more on Israeli responses to this year’s Al Nakba events please visit +972 a wonderful web magazine opposed to the occupation.